These programs are designed for those who are actively engaged in the practice of youth ministry or children’s ministry and feel called to deepen their own understanding of the practice of that ministry. The program will equip participants with foundational learning, rooted in the practical application to their specific ministry context. This program is designed to provide an overview of core biblical, theological, Episcopal, and practical knowledge that will be applied directly to the practice of ministry in the students' context. The two programs will run concurrently sharing some online classes and discussion sessions while also splitting up for classes and readings that are specific to Youth Ministry or Children’s Ministry. Each participant will complete a Ministry Statement and a Ministry Plan for their specific setting, as a way of integrating their learning and the practice of ministry. 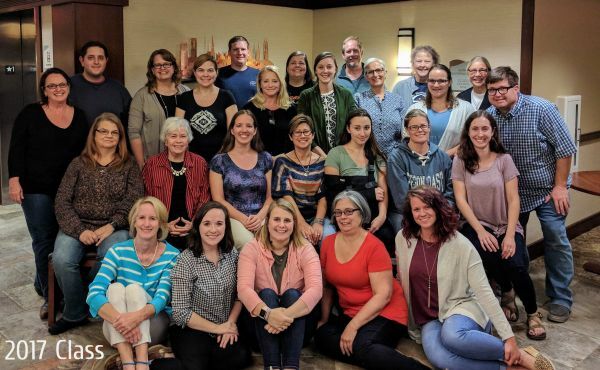 The formation of a community of learners, who will practice and model Formation ministry not just for the duration of the program, but beyond it into and throughout their professional lives, is central to the program. Please apply as soon as possible. Once the above materials have been received they will be emailed to the faculty and an acceptance email will be sent within two weeks. Final Deadline is August 1 for applications or when space is full. (space is limited to 30 students). The formation of a community of learners, who will practice and model Youth and Family Ministry not just for the duration of the program, but beyond it into and throughout their professional lives, is central to the program. The final book list, schedule and syllabi for the 2019 class will be finalized by April 15th, 2019. Below is the previous years model for reference. They will be very similar. Randall is the Evangelist and Ministry Developer for Young Adults and Youth and in the Episcopal Church in Arkansas. Randall’s focus with the Certificate program is in program development, marketing your ministry, communication and peer discipleship with teenagers and young adults. He also coordinates the online platform as well as the acceptance process. Randall has over 20 years experience in Episcopal youth ministry working at churches in the Dioceses of West Missouri, North Carolina and Tennessee and now at the diocesan level in Arkansas. Randall lives in North LIttle Rock, AR with his wife Sandra, daughter Olivia, son Noah, 2 pugs and more tortoises than he tells his family he has. He is also the holy geek at Theholygeek.com. Jamie Martin Currie is the Missioner for Christian Formation and a member of the Mission Amplification Team in the Episcopal Diocese of Texas. Before joining diocesan staff in 2011, Jamie led children’s ministries at St. Martin’s, Houston and St. Bartholomew’s, New York. As a Missioner, she provides formation support for all congregations and communities by cultivating new children, youth, and family ministers as well as deploying consultants to assess formation ministries. She serves as a curricula consultant working with parishes to develop strategies for growth, including presentations on how to attract young people. Jamie also teaches in the Iona School for Ministry while overseeing diocesan youth retreats, youth council delegates and the youth ministers retreat. She served as the president of Forma 2015-2017 and hired the organization’s first executive director. In addition to being an Education for Ministry graduate, Jamie has a master’s in education from Bank Street College of Education in New York where she lived for 21 years. An educator for most of her life -- a perspicacious 1st grade teacher had her coaching others when she was 6 -- Victoria Garvey has a passion for learning and teaching, and unsurprisingly, for the Church. In her professional career she has taught at nearly every level from 2nd graders through graduate school, but she has spent most of that teaching time at one of our seminaries [Seabury-Western in Evanston, IL] where she taught biblical languages and biblical theology, her doctoral area. Most recently, those passions for learning/teaching/Church were fed in her position as Bishop’s Associate for Lifelong Christian Formation in the Episcopal Diocese of Chicago where she even got paid for doing what she loves. These days, she serves on two faculties for the wider church, consults with a couple of dioceses concerning congregational vitality and she continues to speak locally, nationally and occasionally, internationally, facilitates workshops, leads retreats and in her spare time, serves the wider church as board member and committee member of several churchwide commissions and here at home as four-time deputy to General Convention. Jenifer currently serves as Assistant Rector and Chaplain at St. Patrick’s Church and Day School in Washington, D.C. A trusted author and sought-after speaker and retreat leader, over the past 20 years Jenifer has provided resources for Christian formation in the Episcopal Church for teens and adults, including My Faith, My Life: A Teen's Guide to the Episcopal Church, Your Faith Your Life: An Invitation to the Episcopal Church coauthored with Bill Lewellis, and Call on Me: A Prayerbook for Young People coauthored with Sharon Pearson. Jenifer serves on the Way of Love working group for the Presiding Bishop’s office with whom she writes resources and leads retreats for congregations on the Way of Love. Her website www.myfaithmylife.org provides Christian formation resources for all ages. Meredith is Director of Youth Ministry, Holy Trinity Episcopal Church, Greensboro, North Carolina. She specializes in building “Volunteer Hearts.” By leading youth through volunteer/leadership programs, she walks with them on their spiritual journey as they create a foundation that finds great joy and peace in serving others, living as Christ lived. Leads annual pilgrimage for both youth and adults, Camino de Santiago, Spain & St. Cuthbert’s Way, Scotland, as well as annual mission trip,Glory Ridge, providing unique experiences to love the gift of the present and to strengthen spiritual formation.While serving others and making work worship. Mother to son Jack (15) and daughter, Grace (13) and to multiple youth members in the EYC program, ranging in age from 10 to 18. Wife of the wonderful J. Scott, married 21 years. Caretaker for two precious Boston Terriers, Bruno and Daisy. Loves to travel, paint, read and spend time with family and friends. She owns MBScott Fine Art, painting in mixed mediums, specializing in angels. She is a life-long learner open to discovery and adventure through spiritual journey and conscious appreciation of God's gift of life.